I’ve noticed that I seem to know, both in the online and face-to-face world, quite a lot of families much like our own but with only one child. A quick search showed that (based on 2006 data), although two children remains the most common family size in the UK, the average number of children per family in the UK has dropped – from 2.0 in 1971 to 1.8. I don’t know in how many cases having one child is by choice, but I know that I recently found myself advocating having a second child to a friend of mine in Australia whose son is at the crawling stage. His emailed response was that his partner gave him a questioning look. She can’t be blamed. Having two siblings close together in age means you just get to the point where life is getting back to normal after the first when the second comes along and knocks everything off kilter again. In defense of my advice, I present to you some evidence based on how our two kids spent today. This morning they went swimming together. Lucy hasn’t been having lessons but today announced that she wanted to go swimming with Oliver. The frequency with which a younger sibling wants to emulate the older one should not be underestimated. It can be a headache (I’m thinking of climbing in and out of cars here! ), but it also brings on the development of the younger sibling. This is a real bonus if, like us, your younger sibling will be very young in their school year. So they each had their swimming lessons, side by side in the pool (though Oliver’s group is obviously more advanced), after which they came home and watched a movie with us after lunch. Thereafter, they played together all afternoon. 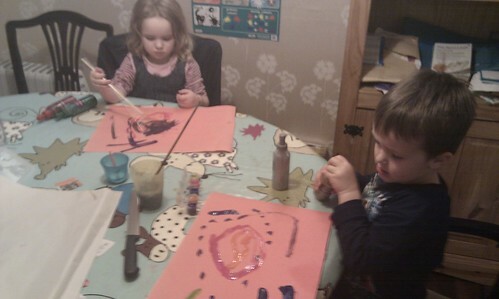 Firstly they got out paper, safety scissors and glue and set about making artistic creations in Oliver’s room. 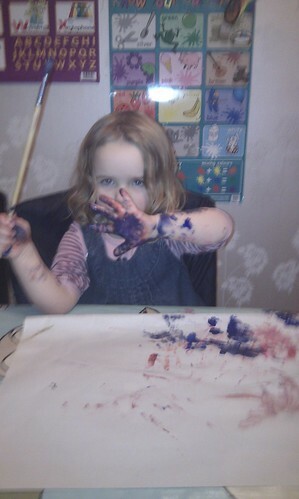 Then they came downstairs and Hayley got them some paints out. 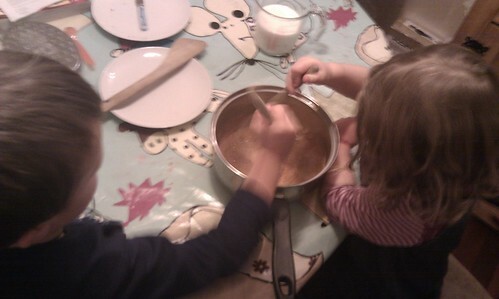 They both then helped me to make a Tuna Pasta Bake for dinner, grating cheese, crushing crisps mixing ingredients and and stirring the sauce. Finally, as bedtime approached they chased each other all round the house on the pretext of stealing a tiara from each other. (I should hasten to add that Oliver didn’t wear it: he is generally, vehemently opposed to any girly, Princessy things at present!) I missed filming my favourite bit where Lucy had Oliver pinned down and was tickling him, but I did get this clip (below) of Oliver letting his sister get the upper hand. 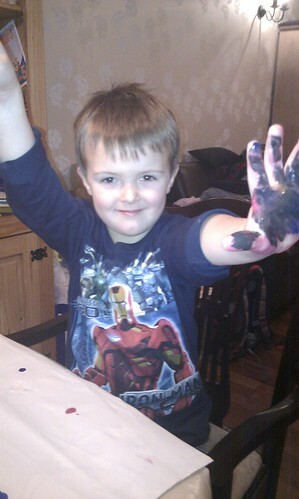 Rest assured he is laughing all the time (note the declaration of “I like it Daddy” half way through). So there you have it. Evidence, if ever it were needed, that if you want a bit of peace on a Sunday afternoon, you can do worse than having another child! Yeah, Lukas needs a sibling. We need to get our adoption papers in. If your adoption process is anything like as convoluted (or "careful", depending on your point of view, I guess) as that in the UK, I suspect it could prompt a few blog posts!